...one for the informed, and one for the uninformed. ...the fact is, the uninformed "buyer of a college education" generally spends thousands of dollars more than the informed. Helping your clients become informed buyers of a college education - and saving them thousands of dollars in the process - is our mission. Take the first steps toward helping your clients fund college, without going broke in the process! College is expensive - period! The average four-year cost for an in-state university is $96,000 and $188,000 for a private college! No wonder that, according to a recent Gallup Survey, 73% of parents with children under the age of 18 worry about college funding more than any other financial matter! With absurdly high and ever-increasing college costs and average graduation rates of almost six years per child, parents - irrespective of their income - desperately need advice from their financial advisor that can help them save ON and not just FOR the cost of college! Collegiate Funding Solutions' college-planning software, API, subject-matter experts, college admissions and financial aid services, educational resources and marketing material equip financial advisors and financial services organization to meet this rapidly-growing need and grow their business and revenue in the process. If you can't help these families, who will? Another advisor? Adding to an already impressive list of partnerships, CFS is now an approved software provider for Independent Registered Investment Advisor & Broker-Dealer United Planners. 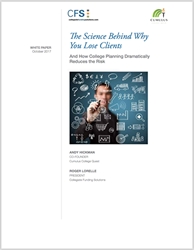 Our partnerships validate CFS as the leading college-planning software for financial advisors. 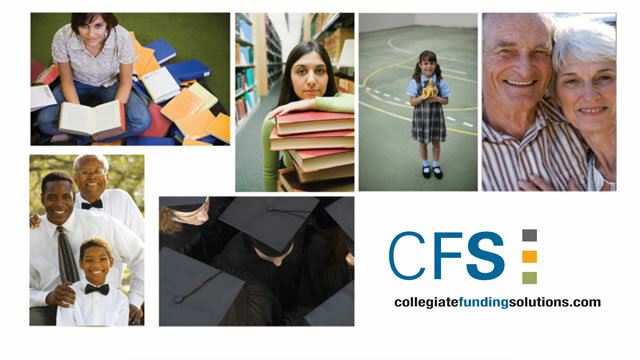 CFS' College-Planning Widget is a game-changing marketing and business development tool that will help you grow your business and revenue with college-planning services at a fraction of the cost of traditional methods. Everything at CFS is directed by our mission - to help families save ON and not just FOR college costs with the help of their financial advisor/institution.